About 2 000 years ago (100 BC), life began to change significantly in the Western part of Southern Africa. Herders, also known as the Khoikhoi, arrived, bringing with them a different way of life and new ideas about the world. For the San hunter-gatherers many aspects of the Khoikhoi way of life were strange and difficult to understand. 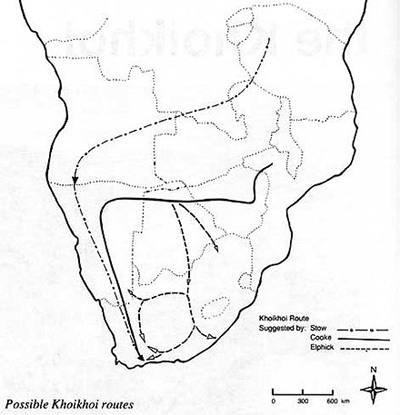 This map shows three possible routes the Khoikhoi took to Southern Africa. The part of the route that some historians agree on is based on radiocarbon dates for sites along the way. Others argue that this is the more likely route as there is a greater supply of water and pastures along it. There is evidence of similarities in the language of the descendants of people along this route and the language of the first Khoikhoi people that the European settlers met. There is no archaeological evidence to support this route. Who the Khoikhoi were, what was their lifestyle like and why did their arrival bring great changes? For a long time the Khoikhoi were called "Hottentots". If one met the people called "Hottentots", they would say this was not their name. They called themselves Khoikhoi, which means "men of men" or "the real people". Groups used name like this to show their pride in themselves. Early European visitors to Southern Africa did not know what the people who lived near the coast called themselves. The language they spoke was full of sounds, which Europeans found difficult to pronounce. 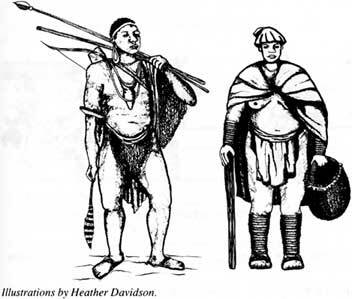 One of the words that the Khoikhoi used when they danced sounded like "Hottentots". As a result, the Europeans began to call the Khoikhoi "Hottentots" today regarded as a word of insult. Khoikhoi, the people's name for themselves, is used instead. The story of the Khoikhoi, the herders of Southern Africa is told by material remains, rock paintings and stories passed down. There were no other records of the way of life of the Khoikhoi until the arrival of the Portuguese explorers in 1488. "People who live as herders have to be nomads, they must move from place to place to find enough grazing for their animals. Each group of herders followed its own seasonal pattern of movement from one pasture to another. Most of them lived in the drier western half of Southern Africa and seldom stayed in one place for more than a few weeks at a time. Their possessions were limited to the amount that could be carried by themselves and their cattle. Their huts were lightly built of bent poles covered with reed mats. They could be put up or taken down in a few minutes. Even their pots and wooden milk pails were specially made with two small handles so that they could be tied onto the backs of the cattle." ”¦cattle are a sign of wealth. The Khoikhoi ate cattle that had died, or that they had captured from their enemies. They killed their animals for meat only in special occasions, like weddings and funerals. When possible, the men killed wild animals for meat... Women milked the cows and ewes, and collected (gathered) veldkos, that is, the plant foods which grow naturally. Although they were herders, the Khoikhoi also got food by hunting and gathering. There are at least five different groups among these people. Early this morning the chief of one group, the Gorachoquas, came to the fort. He brought with him six head of cattle as a present, and requested that we should protect them against another group, the Cochoquas. The Cochoquas had begun to worry them in all sorts of ways. They had inspected their huts and possessions pretending to be looking for tobacco, which they knew the Gorachoquas did not possess. They had also begun to drive up their livestock so that they were grazing almost among the herds of the Gorachoquas. Moreover, they had forbidden the Gorachoquas to proceed to the Hout Bay area with their livestock because as soon as they had used up their present grazing area, they intended to occupy that area for themselves.
" The spread of the Khoikhoi herders into the Cape resulted in a conflict of interests with the San hunter-gatherer inhabitants of the area. A major source of conflict was competition for game, such as zebra, antelope, and wildebeest. Although the Khoikhoi were herders, they relied heavily on the spoils of the hunt for their daily food... The Khoikhoi usually slaughtered their cattle only on special ceremonial occasions even though they provided obvious source of protein. Also, milk from their herds was an important supplement to their diet. However, its production was often irregular and depended on the state of the pasture and the presence of new-horn calves in 10 the herds. But while the Khoikhoi started competing with the San for game, their sheep and cattle were creating a further problem by denuding the pastures on which the game was dependent. As the San watched the vast herds of game disappear, they felt justified in killing or stealing the animals that had taken the place of the game. This in turn set up a deadly cycle of raid and counter-raid, sometimes ending in full-scale warring between these groups all of which lasted for many centuries. Finally, the contact and conflict between the Khoikhoi had far-reaching effects in both cultures. On the one hand, the Khoikhoi began to organise themselves to larger groups in order to form a united, stronger front against the cattle-raiding San. 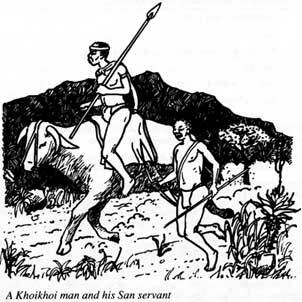 The San, in turn, were faced with three alternatives: some the continue fighting and retreated into mountain and desert areas; others established themselves into bands of robbers which raided the herds of the khoikhoi; while others made their peace with the Khoikhoi and entered their society as servants, hunters, herders and warriors. Many San men who chose the third option slowly obtained stock, and later, if they married Khoikhoi omen, were accepted as members of these communities. Adapted from Illustrated History of South Africa: The Real Story, p 22. 1988. Reader's Digest Association South Africa (Pty) Ltd. Used with permission.